Over 11 years in property investment, Melanie Hardie has experienced some incredible results and a few crushing setbacks. She talks to Stefanie Garber about how to weather the highs and lows of property investing. All but the luckiest investor will experience a roadblock at some point – the house that won’t sell, the declined loan application, the nightmare tenant. When investors sign up for a sales contract, they also take on the risk that their investment may not work out as planned. But as Melanie Hardie knows well, you learn as much from your missteps as your victories. Within the course of a few years, one of Melanie’s properties was lauded by designers for its aesthetics and another trashed by tenants. She has been caught in a mining town crash but also identified high-growth performers. Although the road to riches isn’t always smooth, Melanie has never shied away from embracing new opportunities. While other investors spend hours poring over the latest listings, Melanie took a novel approach to buying her first property – she got her mum to do it. By 2003, Melanie had moved to Sydney after a stint working overseas. Her job in media frequently brought her into contact with property experts who extolled the virtues of investment. “I was living in Balmain at the time with my partner and I thought ‘That’s it, I’m going to buy a property’,” Melanie says. One expert suggested she buy within two to five kilometres of the central business district of a city to maximise growth potential. Based on these parameters, she identified Leichhardt in Sydney’s inner west as a suburb on the move. The first property she inspected was an apartment valued at $300,000. “As I was standing there outside this apartment, around 15 planes went across overhead. I just thought to myself, ‘I can’t do this’,” she says. Unimpressed with the offerings in the Sydney market, Melanie called up her mum in Perth with a mission: find a house in the inner city within her $300,000 budget. “My mother went to have a look at properties and found a 100-year-old house that had a lot of character in a suburb called Leederville, which is just outside the Perth CBD. She sent me a whole lot of pictures and I just said, ‘Buy it’,” Melanie says. The house was in rough condition, particularly compared to its luxurious inner-city neighbours. After Melanie purchased it for $312,000, the property leased for just $250 per week to students from the local TAFE. 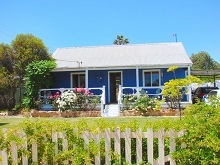 In 2007, Melanie moved back to Perth and planned to give her property a much-needed renovation. But Melanie had no idea how much work would be involved. “When I walked into it, it was revolting. There were no light sockets that worked and no TV antenna. Not even the water worked,” she says. Before moving, Melanie had undertaken a course in interior design, so she used all her skills to bring the property back to life. The total renovation ended up costing $100,000, though Melanie says she was able to minimise costs through wholesalers and DIY. “I did a lot of it myself. I painted walls, painted floorboards and sewed curtains,” she says. Melanie hoped the makeover would boost the property’s value and appeal to tenants. However, she outdid all expectations when the formerly “revolting” property was featured in a House and Garden spread. Currently, the house rents for $730 per week and is valued at $950,000 – an increase of almost 300 per cent in 11 years. For Melanie’s next purchase, she wanted to take advantage of Western Australia’s booming resources sector. She heard reports that Newmont Mining was opening the biggest open cut gold mine in the southern hemisphere near Boddington. In 2007, Melanie rushed in and secured a house in town for $370,000. However, prices in town never took off as predicted. Instead of experiencing massive growth, the house depreciated in value and is currently worth just $320,000. “Because it’s a mining town, everyone built there – it’s a matter of supply and demand,” Melanie says. Today, Melanie is keen to sell up but is facing a $100,000 loss. She plans to ride out the current downturn in the mining sector until a better opportunity to sell comes up. The saving grace is that the property continues to pay for itself. “When it’s rented and Leederville is rented, I’m positively geared. The Boddington one rents for $300 per week, the other one rents out for $730 per week and my mortgage on both of those is about $2,900 a month. So it’s not actually costing me anything,” she says. Overall, Melanie believes mining towns are not worth the risks. While people will always want to live in a city, demand in remote towns like Port Hedland or Newman is heavily tied to local resources projects, she believes. “I wouldn’t go anywhere near a mining town again, only because they’re so cyclical. It’s very much dependent on what’s happening in the mining industry,” she says. Dealing with tenants in a small town has also been a headache. Melanie thought her property was in safe hands with a local property manager. But what she discovered when the tenant moved out left her shocked and angry. For the full story, see the box to the right. Melanie was on the lookout for new approaches so for her third purchase, she decided to buy into a retirement village. These properties offer an affordable entry price and a good growth proposition, Melanie believes. However, in Western Australia, you must be over 55 to buy this property type. As an alternative, Melanie looked to Griffith in New South Wales. She bought the villa through her self-managed superannuation fund for $82,000. “It’s a 10-year loan, so I don’t have to put any extra money into it, and in 10 years I own it outright,” Melanie says. Currently, the property is worth $155,000, a substantial increase in a short time frame. By contrast, managed funds were offering returns of just eight per cent in her super, Melanie says. She believes the rising demand for retirement facilities will help fuel growth in the future. “You just hope in 10 years’ time it will be worth more, especially with the aging population,” she says. Back on the west coast, Melanie plans to team up with her partner Steve for future projects. A builder by trade, Steve has already worked with Melanie to renovate their home in Perth. “I will have an idea, like ‘Wouldn’t it be great to have shelves’ and he’ll just make it happen. It’s very handy,” Melanie says. Steve has dabbled in property investment himself. In 2006, he bought an apartment in East Perth for $480,000 and spent $15,000 on renovations, keeping costs low by doing much of the work himself. In July this year, he sold the unit for $610,000. Now, the couple are looking at purchasing together. However, there are hurdles to overcome. Steve runs his own business, which can make applying for a loan more challenging than if Melanie applied by herself. “When you’re running businesses, the loan structure is quite different to when you have a job and a paid salary. Banks think paid salaries are better than businesses, even if you might be making double the money,” she says. So far, Melanie’s most profitable strategy has been buying within the inner city. Yet as prices rise in the capitals, she believes this approach has become unrealistic and financially unsustainable. “I have moved away from that because it’s becoming increasingly difficult to do,” she says. Instead, she plans to look further out for suburbs with good infrastructure and future developments in the pipeline. “For instance, in Perth, I ask where are the railway lines going – are there new stations? What is happening with the council? And is it near the river or near the ocean?” she says. In hot market conditions, Melanie believes properties in need of renovations can help investors buy into a good area at a lower price, though balancing the budget is critical. “If you buy one in those inner suburbs, usually the houses are quite rundown, so then you have the difficulty of getting good rental yields without spending too much money. It’s a catch-22,” she says. Luckily, she and Steve are well placed to take advantage of opportunities that might scare other buyers away. Over the past several years, Melanie has proven that even the most neglected house can be turned into a showstopper. “If you have the skills to be able to do up a house without spending a lot of money, then it makes it a lot easier,” she says.